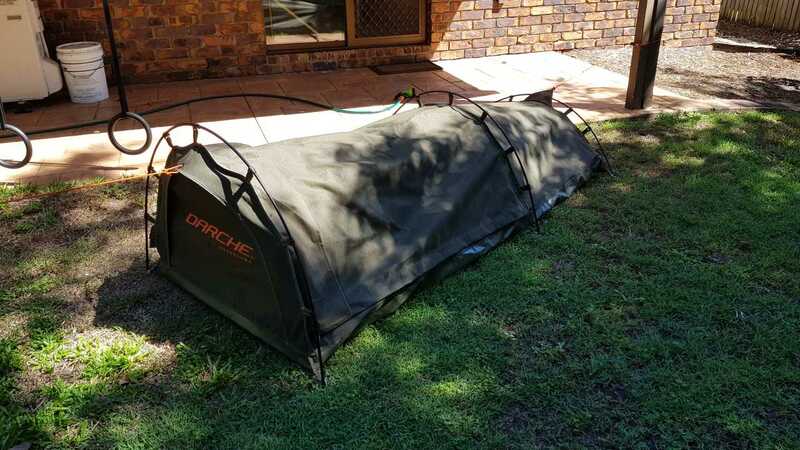 Last year I purchased a Darche swag after a careful consideration of the features I wanted, like a conservative size and green-ish colour to blend in with the environment as well as room for my camping backpack inside while sleeping. 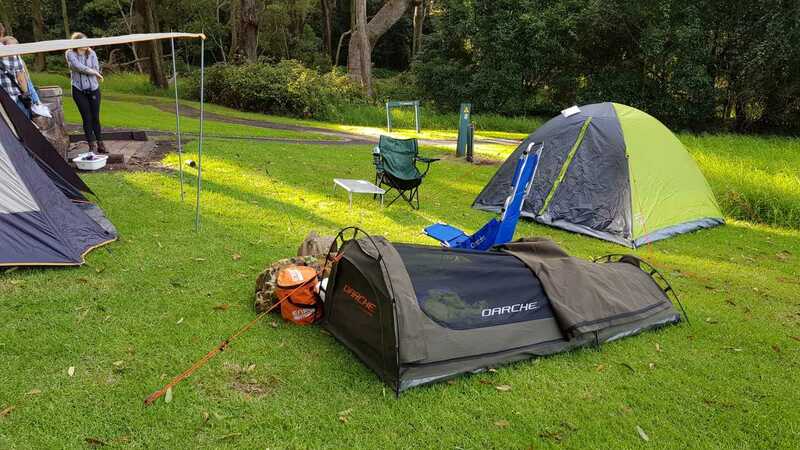 I would be using it for regular camping trips as well as a bugging out if the need arises. Fig1. 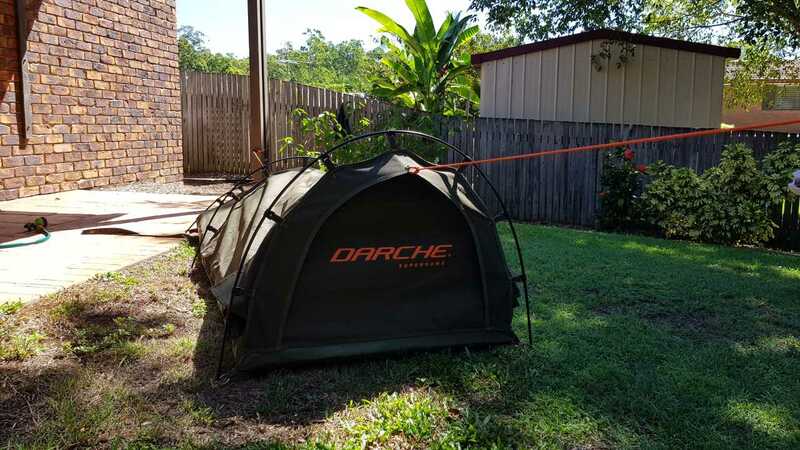 – The set up Darche Superdome on a camping trip. Fig2. – The packaged swag. Upon receiving the swag I immediately set it up outside which only took 15 minutes for the first time. The poles felt like they would snap given how much tension they are under when bent, but overall they seem to have been designed for it and they are going strong. I then had a good inspection of it for any faults before dousing it with water to prime the canvas material. 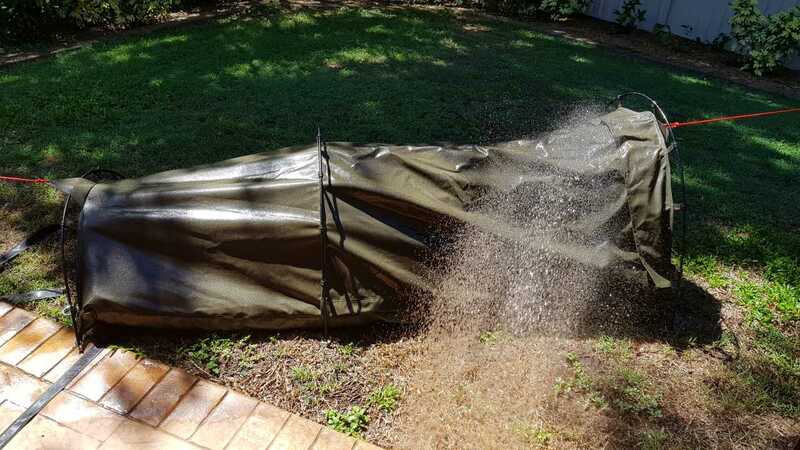 Soaking it binds the fibres together more tightly to decrease the chance of rain getting between them and should always be done before using canvas swags. I soaked it two times thoroughly on all sides before hopping in to check for any leaks but thankfully there weren’t any drops in the inside. 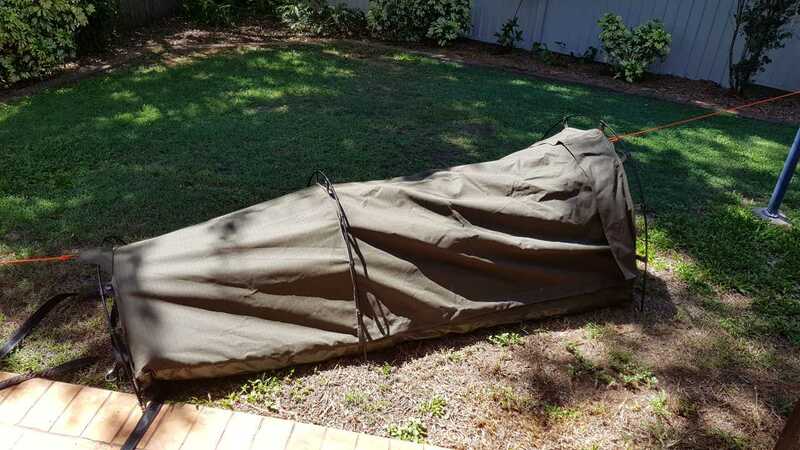 After letting it dry completely I then pulled the vacuum packed mattress out of the bag and let it expand to 5 times its size. Fig3. 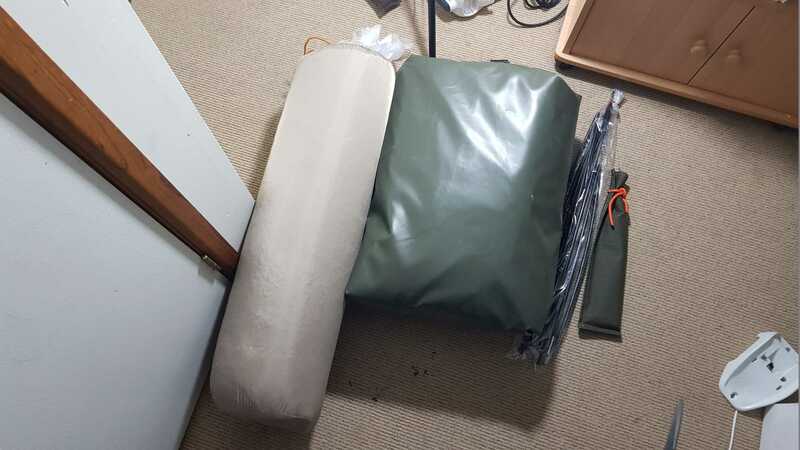 – The swag set up to test for leaks. Fig4. – Priming the swag. I love every part of the design of this swag, someone obviously spent a good deal of time working out what should go where and improving the previous versions. 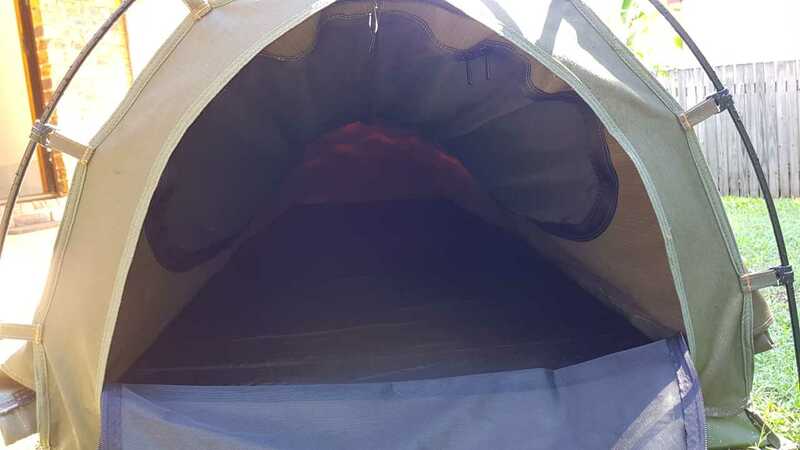 Some notable features are the mosquito nets on both entrances, the incredibly easy to move zippers and the little clip at the top to hold a torch or lantern. The Max-Treme ripstop canvas thickness is very heavy duty coming in at 16oz and 600gsm for the PVC floor. The mesh is 125gsm and compliments the heavy duty nature of the rest of the swag. I would say it feels slightly more flexible then fly-screen mesh. I don’t see anything happening to damage this swag when out on the field from animals trying to get in to branches falling on the top, you’ll surely be safe and snug inside. The downside for all this strength is the weight which is a hefty 13.9 Kg. Not something you should bug out with, especially with the mattress. I will exchange the mattress for an inflatable one when bugging out as it takes up so much space in a car or especially a bike. Valuing the methodical construction of the swag and it’s durability I see it as a valuable investment to my prepping supplies as it will likely last a lifetime. Fig5. – View from the inside of the swag. I would have preferred canvas loops for the poles instead of the black clips to improve the strength and rigidity of the structure, but then it may be a little harder to set up. Another reason why I prefer it is to conceal the outline of the swag further as currently there are obvious black loops going around the outside which may make it easier to spot when wild camping. There’s a decent amount of space inside even with the mattress. I’m quite thin myself so I slept with my bag beside my torso and still had enough space to roll during the night. I felt headroom was lacking a little and it would be nearly impossible to turn around or get dressed inside when you’re all zipped up. It’s definitely only a 1 person swag, although if pressed and faced with certain death, you could fit two people in if you leave your gear outside the swag. Fig6. – The other side of the swag also showing the front. Fig7. – The base of the swag. The colour scheme is very similar to what I was looking for, something to blend the swag into the environment to help stay hidden when bugging out or when simply stealth camping. 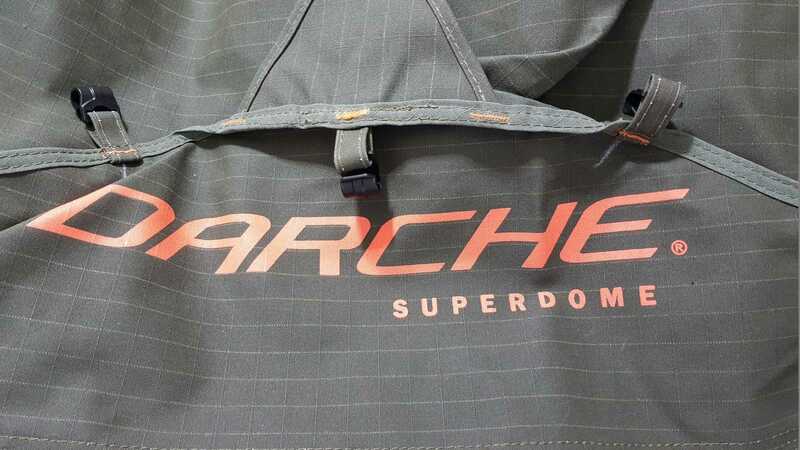 There is however a large “Darche” logo on the front of the swag in a med-bright orange which is actually the opposite colour to the main green of the swag thus making it very obvious to people. I will attempt to paint over it in a green paint to at least lessen the colour to a degree because it’s vital to remain hidden from the sight of others when surviving in a foreign location. The guy ropes are also the same bright orange but these can easily be replaced with green ones if you require. Fig8. – The fabric and stitching. Fig9. – The front of the Superdome wit the flaps open. 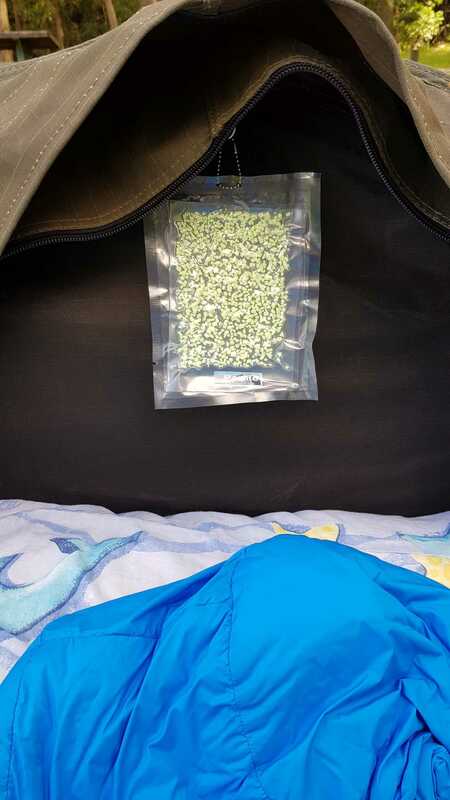 The mattress feels very nice, it’s a luxury size and gives plenty of room for movement inside the swag even though it reduces head space by 5cm as you sink into the mattress about 2cm. It fits perfectly inside the swag except for the end where there’s about 7cm of free space remaining. This could be beneficial however as it gives you more storage space for items inside. The foam inside the mattress cover had a half-tennis ball sized concave indent the whole width of one end, but that’s no biggie as you can just flip it over or use it at the feet end. 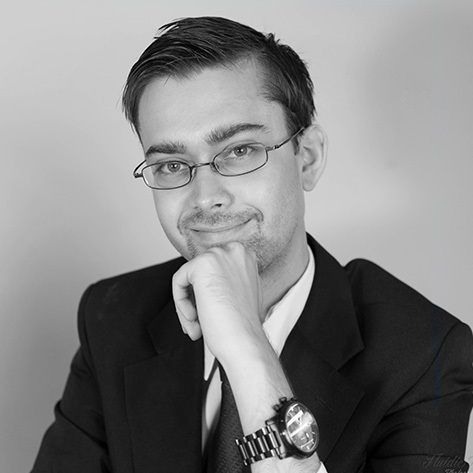 Softness wise, it’s a bit harder than a regular mattress – depending on what you’re used to. It does provide a nice amount of rigidity for your back and I would say it’s definitely better then lying on an inflatable mattress. I felt the mattress lacked a certain softness overall, like it needed a convoluted eggshell layer on the top to feel like a regular mattress – even with a sleeping bag under me. Knowing that this isn’t supposed to feel exactly like a real mattress it did a great job simulating it. If the mattress was half as rigid I believe it would be a nice mix of softness and rigidity as well as being more portable. Which brings me to one negative point – the size. 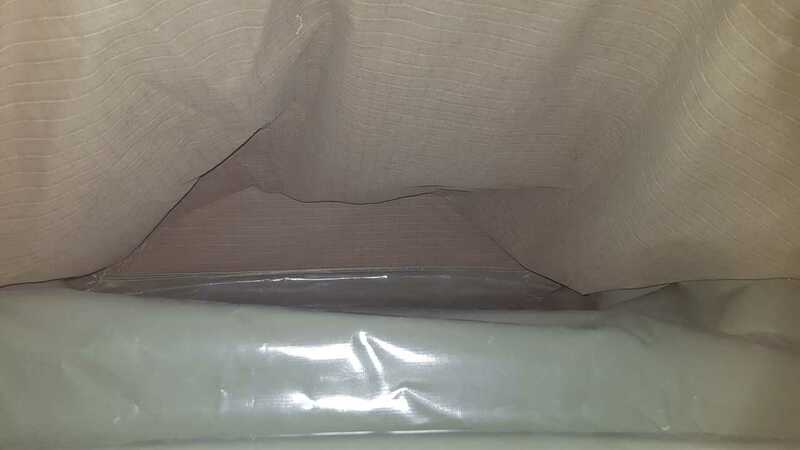 It comes very well vacuum packed in a reasonable size about 35cm diameter and 90cm long. However when expanded it becomes a large 90x210x7cm. I loved how it didn’t make any squeaking or typical “air mattress” sounds when trying to sleep like my inflatable mattresses did on the PVC bucket floor. Fig10. – Inside of the superdome when closed up. Fig11. – The attached small paqlite to the hook inside the swag. One important feature I like is the ability of having two entrances, one in the top and one in the front. The one in the front can be used as a prone position where you can lay with your gun or crossbow and hunt animals… or people. The front entry takes as little longer to get in and out of but may let less insects in if you can master it. You do have to hop in feet first though. The top entrance is the one I prefer because you just need to lift over the canvas flap and unzip the netting and then just in fast. There was a time when I had to get out of the swag fast during one night because I thought my car was being broken into, so I whipped it open and bolted towards the car turning my 2000lm light to max to find the perpetrator… who was only my camping friends, and it wan’t even my car… But it shows how fast you can get out of it. 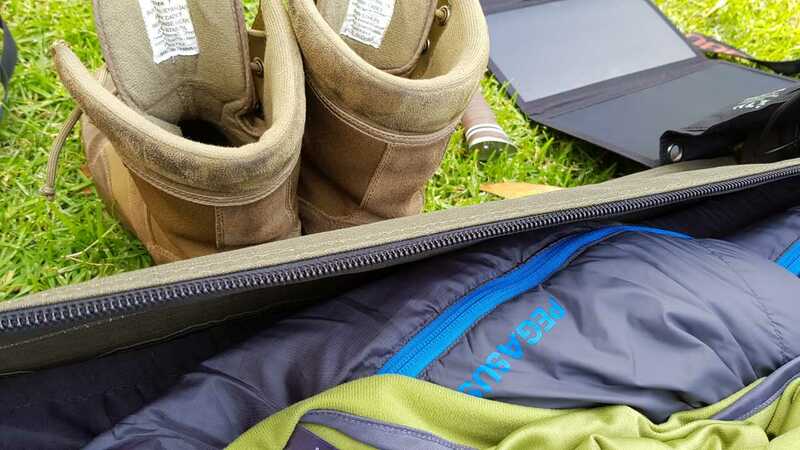 The only problem, I didn’t have time to put my boots on because the zip makes an obvious and semi loud noise when unzipping it quickly and that would have given them time to run had it been criminals. Fig12. – A low shot of the swag to show how it blends with the surroundings. The price is reasonable coming in at A$490 including delivery. I however bought it on a special for 15% more off so keep an eye out for those if you’re interested in buying one. I love mine and would buy another if for some reason it was destroyed. 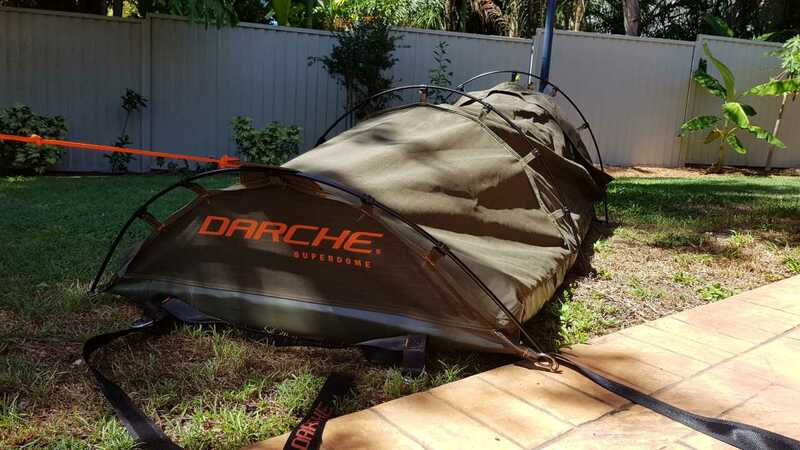 Tagged Darche, Review, Swag, Tent. Bookmark the permalink.